Firstly a very BIG welcome to all the new followers to the Blog and my Facebook page, I am so thrilled and thankful that you are following Utterly Organised. As you can see the blog has been revamped, a sincere thank you to Jessica at Lilipop Designs, it is looking fantastic don't you think? Apologies that things have been a bit quiet from me on the blogging front this week. I wanted to wait until the blog makeover was complete and also my husband has been on holidays this week. Having him home this week has been just wonderful. Although we didn't go away, we spent time together at home as a little family of three, something that we have not done since Mr B was born back in December (and that wasn't the most relaxing of times!!). We were blessed with a week of beautiful sunny Melbourne weather, definitely out of character for this time of year. We have eaten out, slept in, watched dvd's and taken long walks as a family. I have had a week off housework, the gym and cooking and I feel very recharged. We have all enjoyed the lazy days at home and enjoying our precious time together with our son before he grows up and doesn't want to spend any time with us at all!! Mr B is now 7 months old and he is just loving sitting up and playing at the moment. 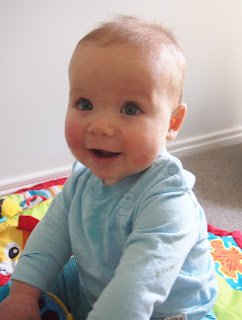 As they say, time flies when you are having fun, and my little man is growing up way too quickly for my liking. 7 Months already- getting cuter by the day! Hope you all had a wonderful week, it truly is so nice to be back! Loving the blog makeover! It looks fab. And pleased to read that you've had a relaxing week with your family. Sometimes a holiday at home is the best holiday to have!